When you hear the words, "family oriented," what do you think about? I have really wondered what people's perception of these words are. It's just one of those things that I ponder about as I lay in my bed wide awake at night. A few months ago at my church we had a small group expo that I worked. As I sat behind my couponing booth ready to sell myself, I started looking at all of the other booths there. There, to my right, was the "movie" group. In front of me was the "young married" group and the "middle married" group. To the left of me was the "men's" group and the "women's" group. As I looked at all 25 of the booths there, something hit me. There was not one small group booth for families. I mean, they had something for men, women, and couples....but nothing for families to do together. My church is what most people would consider a family oriented church. I mean we have a huge children's and youth ministry, a thriving men's and women's ministry. You name it, we have it. Everywhere you look, you see families there, but what about the family as a whole? I have asked why there isn't something designed for the whole family to participate in together. The response I have gotten is that there isn't enough interest, or that it would be too much work to put together. I say it will never be too much work to encourage and build up the family unit. It is the backbone of our society. In a world today where both mom and dad work, and the children have a ton of outside commitments, family time has become almost non-existent. Each individual family member has their own interests, with the occasional "family" night thrown in there. The family today has morphed into something that resembles the drive thru lane at McDonald's. Is the church taking the same direction? Are we catering to each individual piece of the family without ever really ministering to the family as a whole? Is all we are doing as a church body, taking even more time away from the family? Are we encouraging even more outside activities that include parts of the family, but never the family unit as a whole? How can the church encourage family relationships? How can they encourage families to serve together? Many people that I talk to about families in the church have never given thought to this. I'd love to hear your thoughts on this. I think Christians are under the impression that to be doing something "productive" or "meaningful" for God they need to be doing things for or with the church. I do not think that it is bad to be involved in these activities, but I think we need to see that our first and most important ministry is in the home with and for our families. I struggle with this. I feel I am not being the "best" Christian I can be b/c I am not involved in something. When God has let me know that my main ministry is to my husband and children. I agree with you on how Christians feel when not being involved in many activities. I wonder why that is though. Wow, I could have written your post about our last church. We've just recently moved from there and are still with out a new church home. At our last church, they were very family oriented until it came down to organizing anything. They prided themselves on having a great children's ministry on top of groups geared toward teens and men and women. One thing that I disliked about that church was their desire to bring people in. YOu might wonder why that is. I mean, I think it's great to want to save more people and turn them to God, but that was all they did. They didn't ever get very deep once they got you in the door. I recently called because I wanted to go back and attend a Girl's Night function they were having (something they have every year). They told me they had cancelled it because the church had gotten too big. How is it that the very thing they wanted to accomplish is the very thing that was the demise of their format? They were so centered on outings and spending time in groups, yet the church was now too big to have those group events? Seems odd. Now I've rambled on and on and haven't even answered your questions. lol. I think it boils down to guilt that is from ourselves and how we think people expect us to look. I don't know if it is a society thing or a human thing, but we have a need to impress others. If we really came to the understanding that we only need to impress God our lives would be so much more simple and less stressful. I also think if we can truely come to this point/understanding we would be doing our ministry with out even thinking. It would be second nature. I think we have over time taken the ministry out of our day to day lives and placed it in the confines of church. I see different religious beliefs-that are Christian base-have different meaning to family orientation. I know for me, I grew up in a family oriented family. We might not have shown it like you see today, but we had it, and it's still evident today even though I'm an adult. I think sometimes family oriented isn't always out in the open for an outsider to see. We, as a family, are in the midst of trying to make others see that we want family time. And I don't mean elaborate planned events to do as a family. Just spending time together outside, at a picnic, reading together on a Sunday afternoon or just getting down on the floor and playing with the kids. People will usually accept no for an answer if you have a "planned" event to go to and can't go to their event. But when you say you are spending time with your family at home, they tend to see that as different and not as important. We are bombarded with opportunities at church and in our community to do things as a family, but with other families. And while these are important, nothing can take the place of me spending time with just MY family and no one else. I am not surprised that my non-Christian neighbors don't get this, but I do get upset when I have to explain to my church family that I need a break to be with my kids and husband by ourselves. It's a constant struggle and one that you can lose control of if not careful. It seems as though, like D&Xmommy said, people either feel the need to be involved or guilty that they're not. Tara, I agree with you about just being with your family. Not planning a big event, but just being together. So, is it even the churchs responsibility to offer things for families to do, or would it just be one more activity on the "to do" list? Would the answer be to decrease the amount of programs the church offers? Or would that drive the masses away because the church doesn't offer enough? For me the more activities offered seems to be just one more thing to have on the "to do list". I will not say that there should be less ministries offered. If there are people willing to head them up and go keep those programs running. However, like Tara said I don't appreciated fellow Christians making me feel guilty if I am not attending these programs or ministries. This was a huge deciding factor when we changed to our current church family. We came from a ministry that made you feel guilty and bad if you were not at every single thing they offered. I agree with you Teresa. In all of the churches my husband and I have been in together, with our children, there were never any groups that we could bring the kids to. 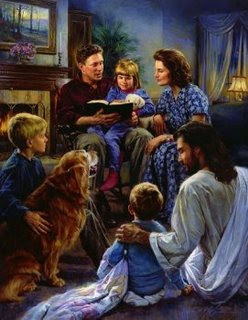 Oh we desperately needed the married small groups earlier on in our marriage, but without a babysitter, we couldn't go. I have often felt like society sees children as an inconvenience and sadly, it seems, that a large part of the body of Christ views them the same way. Children should be viewed as the precious treasures they are, not percieved as something that gets in the way of you having fun. Our current church though, does not view children as little ones who need entertaining on Sunday morning. They have dedicated volunteers who impart the Word of God to our youngsters. Family is the foundation of the church we go to now. And I am SO grateful! Children should never be an afterthought. They were important to Jesus, so that should make them important to us! We have chosen to stop putting our daughter in the nursery, as we feel that her spiritual education is our responsibility, and the nursery workers were trying to fill that role for us. (They weren't very adept at working with us in that.) We have her in church with us now, and we love being a family together! We've also found a volunteer ministry that we can do together as a family. We volunteer to cook meals at the local Ronald McDonald House (for families who have a child in the hospital). Our daughter goes right along with us, and either sits in her high chair, visits the families staying there, or little tasks like tearing lettuce. I completely agree with the questions you've posed in this post Teresa. It makes me sad to see the decline of family carry over into our churches. We have recently been looking at new churches as we really needed to find a new church home. One of the first we went to is a larger, 3-campus facility. I kid you not, the greeter at the door, first words out of his mouth: "children's ministry is right this way." We explained that we were just visiting but hoping to join in the future, if everything worked out, and that we were just going to keep the children with us. From the time we walked in the main door until we entered the worship hall, 9 people came up to us to tell us where the children's ministry was. Once we were seated, the woman behind us tapped Eric on the shoulder to let him know "there IS a children's ministry here." It was frustrating, and we did not return. I am not opposed to children's ministry, but I just felt as if we were not respected as a family. I think you came up with a great solution in the comments here. Maybe the best idea is not for a church to have a specific family ministry, but to choose one day a week (or so) as a moratorium from all other events and encourage families to do something together. I love that idea! Amen and Amen, Teresa! I thoroughly enjoyed this post! You are so right. This is why I love our church. We do not have a "family" Sunday School but everything else is based around the family and almost every family is a "large" family by societies standards. We used to be in a large church that catered to every other group and I hated that I always felt seperated from my children. Michele, I have heard of family integrated churches and have actually visited one in Houston. We loved it. They have nothing like that here that I know of. I have also checked into serving at the shelter here as a family. Problem is, I can't bring my 3 youngest with me. The children have to be 8 and up. I just cook meals for my church. Kate, I know what you mean. I think most churches do not expect you to keep your children with you, even if it is your first time there. Hi I am new to your blog. My husband and I are in youth minstry. I see this stuggle all the time. I think the problem with family oriented actives lays with in the familys themselfs. We live in a age where the church looks and sounds the same as the world.. Not a pretty picture of Jesus... We have broken familys, We spend more time meeeting the needs of one person. Moms, Dads, Kids, singles. Then getting to the heart of the problem the family as a whole not being what God wants them to be a whole family..just Beans View on things... Great blog btw.. check out mine if you want..
mrslunch, one of our closest friends and his wife are the youth pastors at our church. They invest alot of time in those kids and love them. I know they see "church" kids from broken families all the time. I do wonder why the church, or should I say the people in the church are just like the world today? It's a tad confusing. There were things that were "taboo" when I first started getting involved in the church 20 years ago that are quite acceptable now. I can't speak for other people, but I do know it took me 35 years to understand the importance of relationships and connecting with others. Our culture really puts a lot of importance on those things. It's everywhere and quite pervasive. I've noticed that most people have trouble with that one (in church or not). Who am I? Well, I am a happy wife to the love of my life and I am a mother to 8 beautiful gifts from God. I am a passionate person. There really is no middle ground with me. It's all or nothing, baby. My first passion is my God. I am who I am because of Him. I am a daughter of the most high God! Right under God is my family. I live and breathe family. Family is what it's all about folks. I realize my family is different than most, but I hope if you ever meet us you'll be blessed because I just happen to think that I have the best family ever! Lastly, and why I really started blogging in the first place, I am passionate about helping women. I love to help empower women to be all that they are called to be. as you would be if you had been called to lead an army to battle for the Lord of hosts." Inexpensive and healthier eggs. Great fun too! Menu Planning Monday: Kids choice week! Menu Planning Monday: Crockpot week! Menu Planning Monday: Using my stockpile!